we’ve been eating a lot of vegetarian and fish dishes recently which is largely due to the spell of warmer weather that we’ve been having. however, this week i’ve been wanting something meaty and what better choice is there than chorizo? one of the things that i always buy when i visit borough market is the picante (spicy!) cooking chorizo from brindisa, a fabulous stall that specialises in all things spanish. their chorizo is bursting with flavour – the spicy heat of the paprika and garlicky pungency perfectly complement the rich meaty taste. roasted butternut squash risotto is one of my favourite risottos and in this version the chilli and garlic in the chorizo mean you don’t need to add them separately. a generous amount of parmesan and black pepper balances the flavours and the lemon juice helps cut through some of the rich oiliness of the dish. toss the butternut squash with the olive oil and season. place on a tray and roast until soft – around 20-30 minutes. meanwhile, put the chorizo in a pan and fry until it releases its oil and starts to cook. add the onion and cook until it is soft and the chorizo is cooked through. add the rice and mix well so it becomes coated in the chorizo oil. turn the heat up, add the white wine and stir while it bubbles away. add the vegetable stock a ladle at a time, stirring constantly and adding the next ladle when the rice absorbs the liquid. 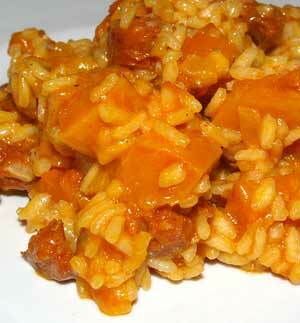 when you have used most of the stock, test the rice to see if it is cooked – you may need slightly more/less liquid. when it is ready add the roasted butternut squash, parmesan, lemon juice and black pepper. cover and leave to rest for 5 minutes before serving. variation: if i’d had some spinach in, i’d have added that at the end just before the butternut squash, so it has time to wilt into the risotto. a handful of fresh basil, also added at the end would be good.